All the questions covered in sample practice exam are basic IASSC Certified Lean Six Sigma Yellow Belt Certification exam questions. To test your knowledge and understanding with the real-time case study based questions, we strongly recommend you to practice with our Premium IASSC Lean Six Sigma Yellow Belt (ICYB) practice exam. 230+ Practical and Real-time Case Study Based Practice Exam Questions similar to actual IASSC ICYB certification exam and their correct answers for assessment. 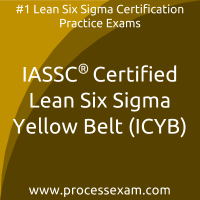 2 Months Unlimited Access to online IASSC Certified Lean Six Sigma Yellow Belt (ICYB) certification practice exam. Our structured and autonomous review system collects feedback from recently certified candidates, based on those inputs our domain experts frequently update IASSC Lean Six Sigma Yellow Belt test questions for practice. Our online practice exam is a simulation of the actual IASSC Certified Lean Six Sigma Yellow Belt exam that makes you familiar with actual exam environment and exam pattern. We offer unlimited practice attempts with our online practice test. Every attempt randomly populates questions from our premium IASSC ICYB question bank that contains 230+ most probable case study based questions prepared by our domain experts. Practice questions will be served in random order with shuffled multiple choice answers to make your IASSC Certified Lean Six Sigma Yellow Belt exam experience more challenging. You can review the results of past practice attempts from result history and assess your performance. Such facilities are the significant advancement over questions in ICYB PDF and far better than fraud dumps sites. According to our survey with IASSC ICYB Certified candidates, you can easily score 80% in the actual IASSC Certified Lean Six Sigma Yellow Belt exam if you can score 100% in our online practice exam. While the syllabus of the IASSC Certified Lean Six Sigma Yellow Belt certification exam was not that tough, but it was extensive. Practicing on the IASSC ICYB mock tests online helped me cover all the topics in depth. This helped me score well in the actual exam. The format of IASSC ICYB Practice tests is the same as the actual ones. They are quite interesting to answer. Once i began, i continued with the practice. I liked the unlimited attempts feature for a premium subscription. It helps in giving mock tests the multiple numbers of times. IASSC Lean Six Sigma Yellow Belt certificate exam has passed. IASSC ICYB Practice tests available online on processexam are the best ones in the lot. I say this because i have succeeded in clearing IASSC Certified Lean Six Sigma Yellow Belt at very first attempt but i using the mock tests online. They are the best-kept secret of mine as i wanted to cut the competition.